I finally scheduled Orbit’s spay surgery for this Wednesday. I’m feeling anxious inside. I know it’s a routine surgery but I can’t help but worry. Last year she had her “routine” rabies vaccination which she ended up having an allergic reaction to. I wrote about it HERE. and not waking up due to blood clots, blood pressure, abnormal heart development and other complications. Optimistically, she will experience zero complications and now the only thing I can somewhat get involved in is her “waking up experience”. Typically after surgery the dogs are placed in recovery crates under the watchful eye of the veterinary team. As they wake up … the dogs will be confused and be extremely groggy and attempt to get up. For their protection a plastic cone is placed on them. Now … cones … amplify sound. And when the dog is waking up from surgery … they will unwillingly bump into the edges of the crate with their cone – further adding to their confusion and anxiety. Luckily for us, we were contacted by Pet Recovery Collars who has sponsored us and sent up all of their different cones to try out. They have several “cone” and “pillow” products which are designed for different recovery needs. The one that is specifically for spay and neuter is their Kong Cushion. 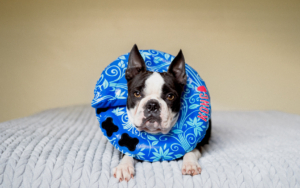 It’s an inflatable donut shaped pillow that provides a more humane alternative to the rigid plastic cone of shame. They designed this with pet specialists and behaviorists. All the details have been thought out. It’s made out of a soft flexible rubber plastic to allow for maximum hygiene post surgery. 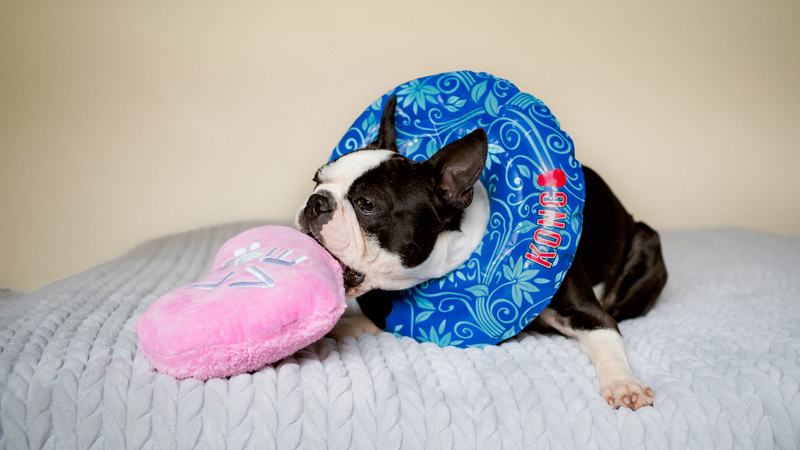 The blue pattern design was selected to help soothe the dog as they wake up. It also has multiple velcro closures to allow for different size necks. I’ve talked to the inventor of this cushion at length. She had designed this originally for her own dog. And has worked with vets nationwide who are now starting to using this in their own offices. I trust that this is the best product for Orbit while she wakes up.